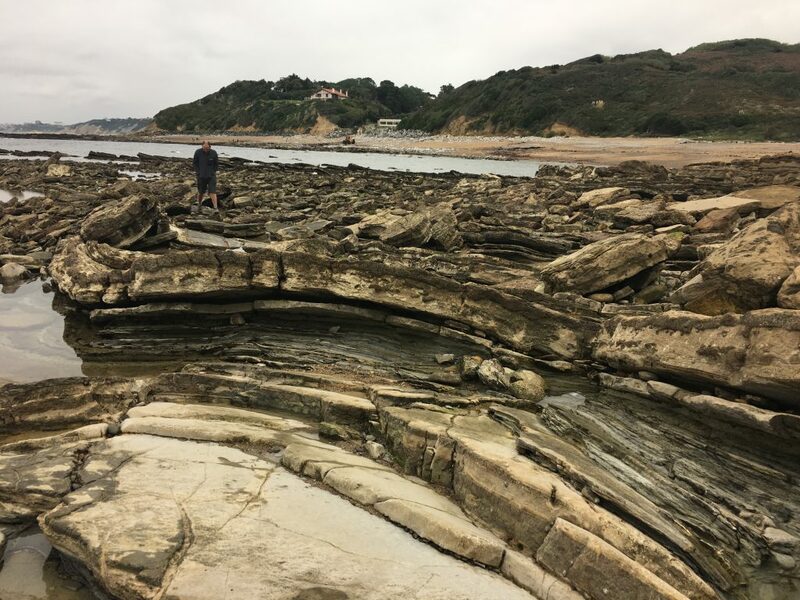 Our guidebook to France had recommended the coastal path from Hendaye to Bidart as being a not-to-be-missed walking route in southwest France. We looked for somewhere to park south of Biarritz, but this part of France is atypically lacking in motorhome facilities and most of the parking clearly signposted as being not for motorhomes (apparently this can be ignored in low season but we weren’t keen on having that discussion with local police). The only aire was in St-Jean-de-Luz which wasn’t recommended and in any case was at the mid point of the walk so pretty impractical – we did see the aire on our walk and were glad we hadn’t decided to go for it as it was on the side of a main road and very tight, at the point we went past there was a motorhome trying to reverse into a space and seemingly wedged in a position where it was impossible to move in any direction, surrounded by ‘helpers’. In the end we decided on a campsite and picked one of the very few that were still open; Camping Le Tamaris is just south of Bidart and right on the coast. The campsite had small pitches but made up for this with excellent facilities. A very nice unheated swimming pool, sauna, steam room and hot tub plus lovely hot showers. The only downside, no toilet seats, why? Not only is it uncomfortable but toilets look naked without them. As we drove south past Bayonne and Biarritz the scenery changed from the flat pine forests that had dominated the silver coast to a more undulating landscape with the added glamour of the Pyrenees in the background. It lifted our spirits to see something different and this made up for the roads becoming more congested as we entered this ‘well developed’ section of coast. The morning after we arrived at the campsite we set out on this much touted walk. South from the campsite the ‘Sentier Littoral’ was mostly signposted with yellow daubed steel markers although in St Jean de Luz these were replaced by circular markers embedded in the pavements. The coast nearest to the campsite was a string of small coves characterized by cliffs of friable folded schist rocks. Sometimes the route was along narrow paths skirting these beaches, with slippery wooden steps climbing and descending between shore and cliff. At other times we shared the cycle route. 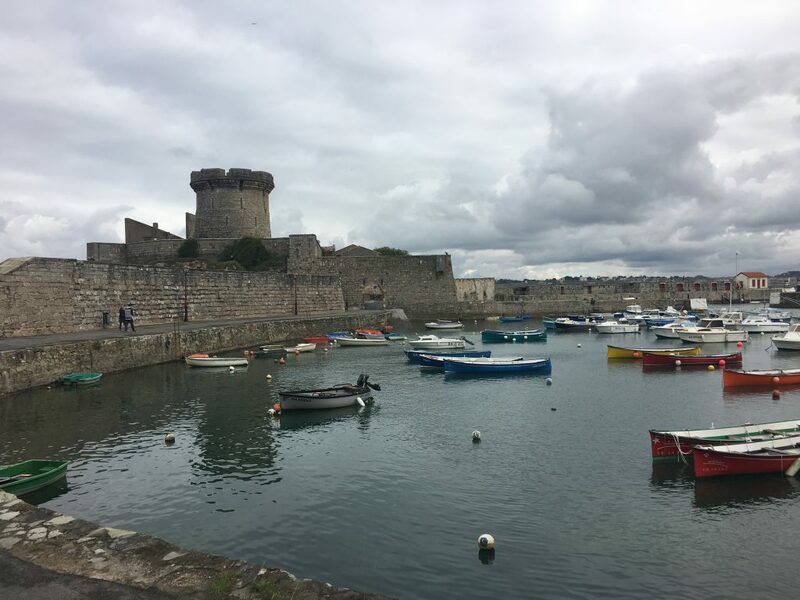 Although it was attractive it didn’t have the same glorious wildness as our favourite British coast path routes and we were very conscious that we were just a few yards away from significant conurbations. 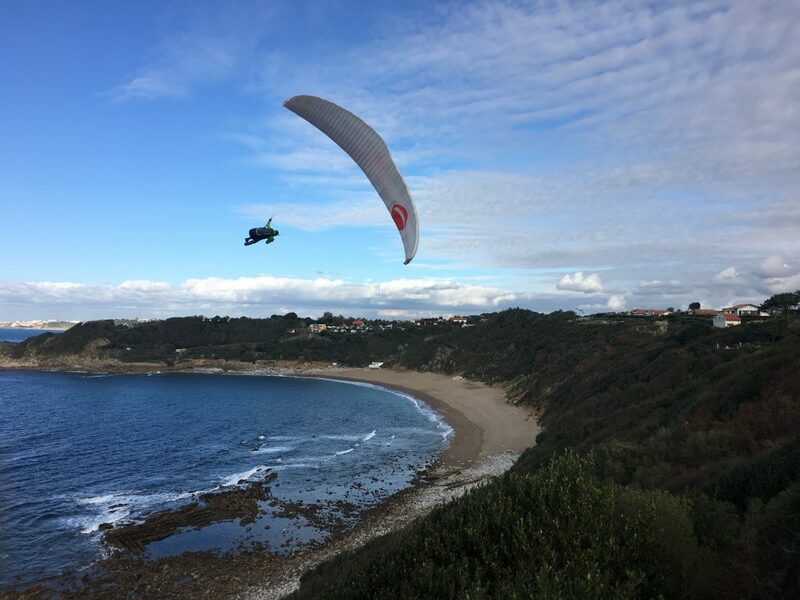 It didn’t seem like any time at all before we reached the outskirts of St Jean de Luz and joined the path around the large bay. From the small park on the Pointe de Sainte Barbe with it’s chapel and signs warning people to stay away from the cliffs we took steps down to the long promenade. This took us all the way along the seafront to the large harbor. From the south side of the harbor we followed the coast road around to the Fort de Socoa past old quays and fortifications which were slowly slipping into the sea. 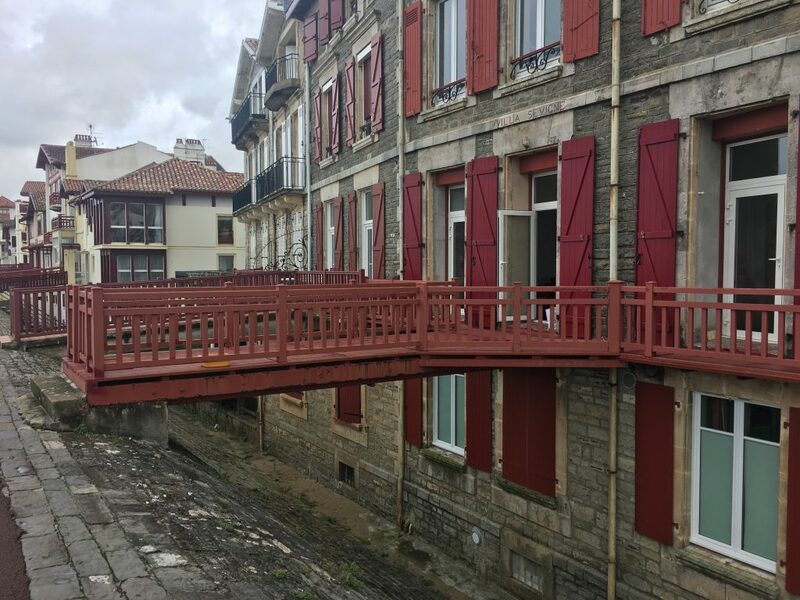 By the time we reached the fort (unfortunately boarded up) we had done just over six miles and it was time to check the bus timetable to see if we would carry on to Hendaye or turn around and walk back. With the bus timings likely to give us a long wait we decided that turning around would be the best choice. To try and provide a bit of variety we took a different route through the back streets of town to the Pointe de Saint Barbe before rejoining the coast path and stopping off for a bit of rock pooling when we reached the beach closest to the campsite. As a walk it wasn’t the not-to-be-missed route that had been hyped, but it was a pleasant and easy day out. Perhaps the section to Hendaye would have provided some additional excitement but we hadn’t got our timing right. We were slightly disappointed but pleasantly tired when we got back to the campsite. I put a load of laundry on and while I waited for it to finish I took advantage of the facilities with a quick swim before relaxing in the steam room. Paul was going to join me but the pool area was quite busy and he only had swimming shorts and not the obligatory pair of budgie smugglers.